"Challenging events present themselves in everyone's life. These events can take many forms: a challenge from an adversary, real or perceived: an internal struggle around a critical decision, past or present: or an unanticipated tragedy, effecting you or a loved one." So notes Ross Lampshire, our selection for Featured Artist in Father's Day month. And we chose him as much for his artistry as the way in which he is an inspiration to fathers everywhere. Ten years ago his son, Levi, a high school student, was critically injured when he was hit by a truck while crossing the street. The accident left him with traumatic brain injuries and the need for around-the-clock care for the rest of his life, which is provided by his mother and Ross's wife for 27 years, Wendy. A challenge that would overwhelm most parents has, amazingly, become a valuable lesson to Ross. "We know how fragile life can be and how quickly events can happen which determine the course of your life. But as a result, we have come to know the power of faith, and the strength of grace" Where do these inner reserves come from? Ross doesn't exactly know. But his heritage and history offer some suggestions. His forefathers on his mother's side were Cousin Jacks from Cornwall, England and were some of the original settlers in Colorado mining towns such as Leadville and Silver Plume. His father's ancestors hailed from a German colony in Russia and settled in the Rocky Mountain West as farmers in the early 1800s. While Ross knows his father's origins, he is less knowledgeable about the man himself, who left the family when Ross was two, to be replaced over the next fifteen years by an Apache Indian, a Montana coal miner, and a cross-country truck driver, whom his mother divorced when she heard him making a date with another woman on a CB radio. She showed up too and met them both at a motel in Little America, Wyoming, and that was the end of that one. Ross had always been artistic, winning a poster contest for safety in the first grade, and selling his first paintings at the age of twelve. Come high school he was notorious for "selective attendance," but he did graduate and immediately went into the restaurant business. Eventually he landed a position as a chef for a large corporation, where he was best known for his food sculptures and cake decorating. When corporate outsourcing strategies forced him to shift gears, he moved into a manufacturing position in the high tech industry, and decided to go back to school, where he earned a BS in Psychology and Sociology, and finally an MBA. While Ross's day jobs paid the bills and put food on the table, to counteract their "analytic nature" he continued to pursue creative outlets. In retrospect, some of his artistic pursuits were... well, let's just say it was smart of him to keep his day job. Example: in the 80s he opened a sideline business called Gone Bananas. Modeled along the lines of the Singing Telegram, he would dress up in a gorilla costume and show up at parties and on doorsteps with chocolate covered bananas in hand. On the other hand, some of his artistic pursuits actually blossomed into new income streams. 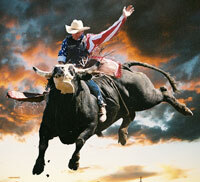 Example: In 1992, he decided to try his hand at sculpting a bullrider. He started out taking pictures of bullriders, but then determined that in order to authentically capture the action, he needed to actually get on a bull. He contacted a rodeo contractor by the name of Ron Rich, who showed him the ropes, and Ross ended up riding bulls off and on for about 5 years. 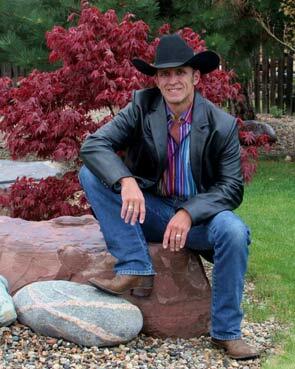 The result: he completed several rodeo-themed bronzes, and ended up becoming an official PRCA photographer. Throughout the 90s, slowly but steadily, Ross became more serious about his art. His early paintings were studies of rock sculptures like the Mayan ruins and Toltec heads from Central America. His subject matter evolved into what he would call "ghost images" of Native Americans. 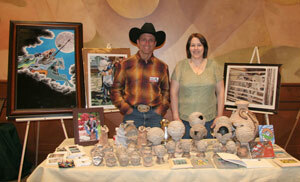 He developed a personalized ceramic line he calls Anasazi Cliff Dwelling pottery. 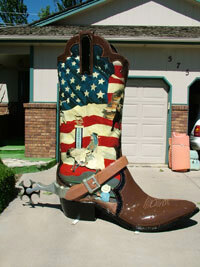 Then he turned his attention to more contemporary Western subject matter, and in 2003 he participated in his first public art project, called "These Boots are Made for Talking", in Cheyenne, Wyoming, in which his "canvas" was an 8-foot tall cowboy boot. 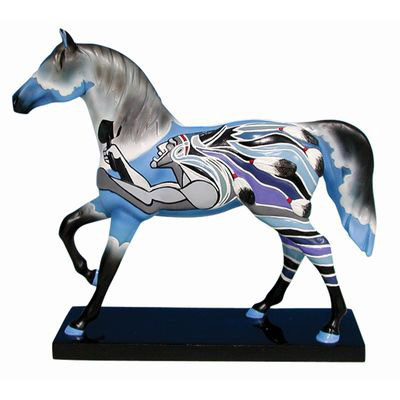 He enjoyed it so much that he began looking for additional opportunities, which led him to The Trail of Painted Ponies national art competition, "The Native Art of Horse Painting." "While conducting my research for the design, I found several accounts where great chiefs had claimed that as they slept the night before a battle, they had dreams that provided them with symbolic details revealing the strategy of the enemy, their weaknesses and how to exploit them. These chiefs would see themselves as bold warriors fiercely defending their land and families and, as a result, it gave them greater confidence to enter the battlefield boldly and win victory." Ross's Painted Pony, "Dream Warriors," depicts two versions of a symbolic dreamlike vision. "One side has a medicine man in a buffalo headdress, representing the spiritual side of warfare, who is raising a war club as he rides into battle. The other side shows a brave, representing physical strength, who rides into battle with a coup stick. Combined, the two sides show how closely the spiritual and physical worlds interact, and the message is you cannot have victory on one side without victory on the other. As for the ultimate outcome, both warriors are riding into battle, bathed in the victorious illumination of a full moon that is breaking through the uncertainty represented by clouds." Although Ross is describing his Pony, one can't help but feel that at the same time he is talking about himself, and that he has met and is dealing with the challenges in own life in the true spirit of a Dream Warrior. My roots run deep in the soil and rocks of Colorado. I was born in Grand Junction, I've spent the majority of my life on the Front Range, and I currently live in Loveland, Colorado. I would describe my home as Asian Southwestern. I really enjoy Japanese gardens and am trying to grow bonsai trees. Officially, my studio is our basement; however, depending on what I am working on, you can find me all over the house. If natural light is critical, I work in our kitchen. If it's really big, I work in the garage. I am inspired by the stories and images that surround me, but I can honestly say that the best designs come to me when I am quiet. An image or idea enters my mind almost like a whisper, and becomes a growing compulsion. The development is fast and takes on a life of its own. I think my style changes depending on the medium in which I am working. When I work in clay, I would characterize my style as "Contemporary-Primitive." Historically, my paintings and sculptures tend to be realistic and what I could call Contemporary Western/Southwestern. Dances with Wolves. The movie was inspiring, especially the landscape and the depiction of the interplay between the cultures. It gave people a lot to think about. My late grandfather, Clarence Lampshire, comes to mind. He was an honorable man who was married for more than 50 years to his wife Rhoda. He worked hard all of his life as a baker, and in addition to teaching me how to decorate cakes, he also taught me the value of keeping your word. Determine what is truly important, and concentrate on that. Don't sweat the distractions.